People quickly noticed that music (however it was more than fine) can't take all CPU's powers. And - since AY chip was typical for ZX48K (interfaces coming from ZX81 in 1981) and for ZX Spectrum 128K (internal AY chip) - the one standard of AY ports stabilized for Spectrum 48 in form of contemporary AY-interface (in CZ/SK known as a Melodik interface), that appeared in (about) 1986, from Polish 'Stavi' company. Sadly today ZX48K scene is rather not very active. Slowly, within years 1996/1999 people moved on 128K models (difference to 48K is more-less like between Amiga 500 & Amiga 1200). However to that moment, ZX48K was a mainstream machine for ZX scene. Nowadays only few groups support Spectrum 48K with their productions and thanx to them You can notice here also progs made contemporary. (To load TAP/TZX files into ZX Spectrum You should use TAP2WAV. To load *.z80 files use K7ZX). Jophar (2019) - a small new-school demo by Shadow/Noice and Yerzmyey. Came 1st in oldskool demo compo of Gerp 2019 party. Fearzone 48K (1998 - 2018) - a new-school demo by Naughty Crew, ported into ZX48 in 2018. Attribute 2 You (2018) - a new-school demo made by MatGubbins and Yerzmyey. Big Things (2017) - SpeccyPL, a new-school demo from Forever. GemBand (2016) - a music collection by Gemba Boys. New View 48K (2015) - a new-school demo from Conscience. Came second on Forever 2015 party. Big Things LITE (2015) - 3rd place on Riverwash 2014. Mission Highly Improbable (2014) - a new-school demo from HOOY-PROGRAM (Gasman, Hellboj, Ralf) with Alone Coder, Lord Vader and TK90X-Fan, made for Forever 2014 party. It took the 1st place in the ZX demo compo. Graphic by Piesiu, Trixs, RedBalloon, Equinox, Yerz. All AY songs by Yerzmyey. BEEPER music by MISTER(ious) BEEP. The Blossoming Years (2015). A big music-collection of MmcM. YERZMYEY's SLIDESHOW (2013). A huge mega-demo slideshow (219 Kb) for ZX Spectrum 16K / ZX Spectrum 48K that contains 16 parts with 16 full-screen pictures and 16 songs. For music You need an AY-interface (only 15th part has music made for BEEPER). Made in 2013. Authors: Yerzmyey, Hellboj, Factor6, Gasman. On Her Majesty's Sceneish Service: Sundown 2013 Invitation. A small nice invitro made by Gasman/HOOY-PROGRAM in 2013. ASTRAL COMBAT - a music-collection released in 2013, containing 3 parts and 8 fully digital songs made by Yerzmyey. Code by Shiru, graphic by Piesiu and Trixs. New Wave - a newschool demo made by Alone Coder and friends (HOOY-PROGRAM, Lord Vader, Trixs and other guys). Came 2nd on Forever 2013. 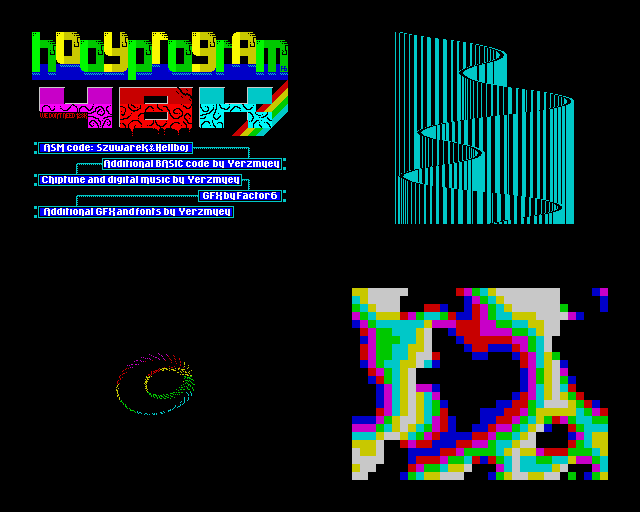 DIZZZRUPTOR - a new-school demo from HOOY-PROGRAM with MAT / ESI, Tygrys, Trixs, Piesiu and Alone Coder. Came 1st on Forever 2012. Contains also a MOD-like digital song. 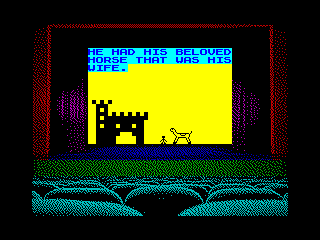 ZEMAN - a funny new-school demo from GEMBABOYS, made for 30 Anniversary of ZX Spectrum 48K. Came 2nd on Forever 2012. ZX DEBUT - a cool small demo from NOICE + friends. Came 3rd on Forever 2012. CRITICAL ERROR - a new-school demo for ZX48K containing also a MOD-like digital song and the first full-screen 3D DOOM-like effect for Spectrum48 in the world. Made by HOOY-PROGRAM with ALONE CODER and PIESIU. Gemba - a new-school demo by Gemba Boys for ZX48K. 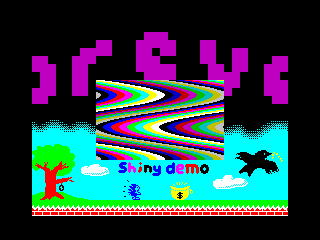 Came second in Forever 2011 8-bit party demo-compo. SILAbbA - a crazy-demo (2009, trackmo style) but still looks nice, has nice music with interesting AY synthesis (at last! :) ) and is really fast as for BASIC. Erdelyi Bela's Sampletrack Collection - a digital music-collection by Exodus (digital / MOD-like music). A HORSE, A HORSE, MY KINGDOM FOR A HORSE OR A SCOTSMAN ON A HORSE!! CannonBall - an old-school demo by HOOY-PROGRAM (1999, mega-demo). CRYSTAL - an old-school style (1993, mega-demo). Dark Music - an old-school style (1994, mega-demo). EXODUS MegaDemo - an old-school style (1993, mega-demo). FIRST ASSOCIATION - a GIANTIC (1,63 MB!!) demo consist of old-school and new-school parts. Only half of the demo is for ZX48K but it still gives You several HOURS of watchin'&listennin'. (1998, the biggest mega-demo ever made on any demo-scene). 1998 DEMO - old-school stuff. Kilo-demo. No Inspiration Demo - an old-school demo, containing also MOD-like music (1993). 1998 Demo 2 - old-school stuff. Kilo-demo. NUMA NO YOJIN - an old-school demo containing famous Czech song "Jozin z bazin". ;) (2008). OVERSCAN - a demo containing fine multicolour effects (1991). DRSP - the demo contains digital music.